The Valley Fault System, which is composed of the West and East Valley Fault traverses to several provinces all the way from Bulacan in the north to Laguna in the south with a total length of 146.71 kilometers. This also includes the whole length of Metro Manila from Quezon City all the way down to Muntinlupa City. About 80 barangays are affected and more than six thousand structures sitting on top of the fault line with over 2 million people in the danger zone. In 2014, we have provided a list of some notable structures, villages, and schools that may lie exactly on the fault to about 500-meter distance from it. It has been predicted that this fault system can possibly trigger a 7.2 magnitude earthquake for every 400 years (+/- 100 years). Last fault activity was recorded in the year 1658. The Valley Fault System traverses to a length of 146.71 kilometers and is composed of two major fault lines. The East Valley Fault extends to about 17.24 kilometers, traversing from Rodriguez (Montalban) on the north to San Mateo on the south; both in the province of Rizal. The West Valley Fault extends to 129.47 kilometers from Doña Remedios Trinidad, Bulacan to Calamba, Laguna. As of the time of this writing and current data available, there are about 6,331 structures that are directly above the Valley Fault System within a 10-meter proximity which would be in potential danger of destruction once the slip-fault moves. This sums up to an area of 2,964.10 square kilometers in danger of collapse. However, the number of affected structures is not definitive as some of the structures have not yet been mapped and the destructive effects of earthquakes are not limited to where the fault line lies. Of the 6,331 structures, the city of Muntinlupa has the most number of structures constructed on top of the fault line consisting of 1,771 buildings. Majority of which are residential buildings with 1,500 houses and 6 condominiums (high-rise residential buildings). 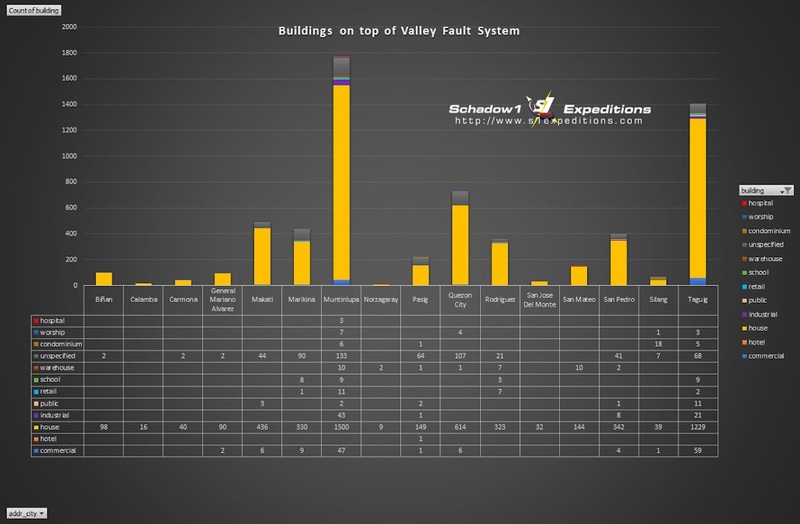 There are about 19 schools, colleges, and universities that are on the West Valley Fault Line to which 29 of their buildings are directly constructed on top of the fault line. These schools must immediately evacuate the premises in case of an earthquake due to the possibility of collapse when the dextral slip-style fault collides during movement. Taguig - Polytechnic University of the Philippines, Army's Angels Integrated School, Sto. Niño Catholic School, Ann Claire Montessori, Gracel Christian College Foundation, Inc. 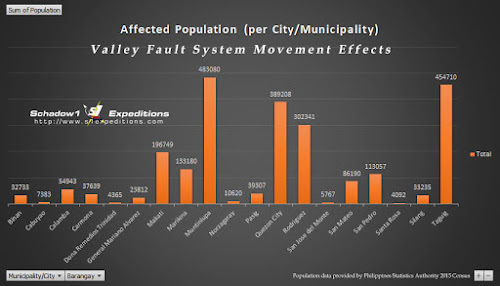 The population is also at risk as the total number of people residing on barangays where the Valley Fault system traverses are about 2,319,432, with Barangay Batasan Hills of Quezon City as the most populated at 161,409. 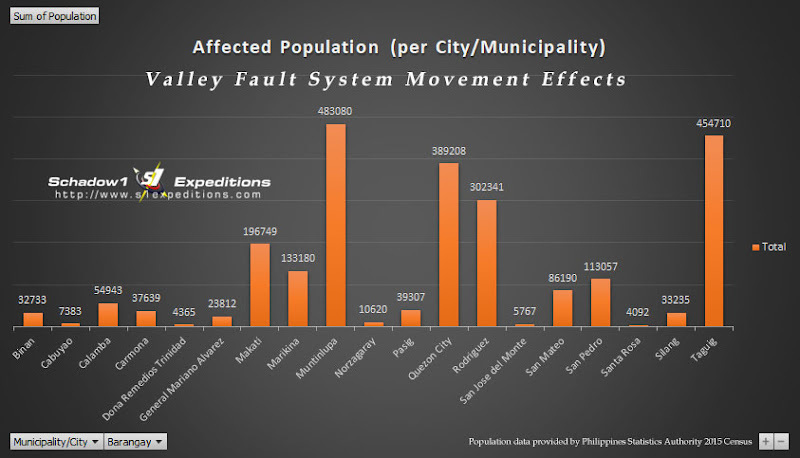 Muntinlupa has the most number of a population exposed to the Valley Fault System, with 8 barangays traversed by the fault, summing up to 483,080 people in total. Massive evacuation might be needed when the effects of the earthquake are at its maximum. 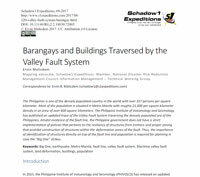 This data and article were written to provide local government units and disaster risk reduction managers to create definitive plans based on this data to minimize the effects of the disaster and for the city and municipal engineers to ensure structures are constructed by meeting the standards for disaster resilient homes and provide proper zoning in their jurisdictions. The public is also made aware of the dangers so that they are prepared when disaster strikes through the "duck, cover, and hold" system, as well as ensuring each family member is equipped with go-bags (survival bags), for immediate evacuation. 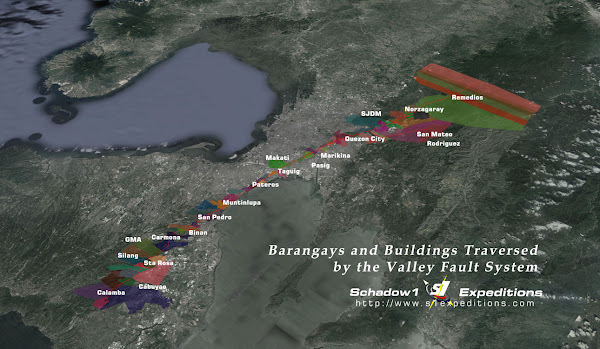 The following Barangays are traversed by the Valley Fault System. This data has been transmitted to the following authorities for use under the license, free of charge. 2017-12-06: Usec. Ricardo Jalad. Executive Director, National Disaster Risk Reduction Management Council. Received 2017-12-07. Earthquakes do not travel along a fault line but through seismic waves. Know the risk areas through this map. Hate earthquakes? Here is a good way to look at it. How the Philippines as an archipelago emerged.